The gec that tested 44 has a broken guide pin.no shorts tight base. Grey anode, Brown curved base, Cup and OO getter. NOS value tubes. The tubes works perfectly! 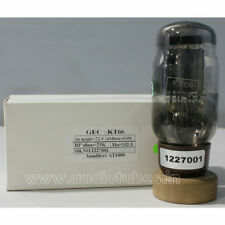 GEC KT66 vacuum tube. XL Z date code. This tube can also come branded as Osram, MOV, Genelex, Emitron. Original tube for Marshall JTM 45 - QUAD II - Leak 12.1. Tests very strong at 112 on my Jackson 648S. No leaks or shorts. Shipping combined with other purchases. Will be shipped well protected. ANY questions, please ask. Thanks for looking! GEC UK KT66 tube in original box. 1 x n ew power tube KT66. tube tests with 100% data current 75mA. 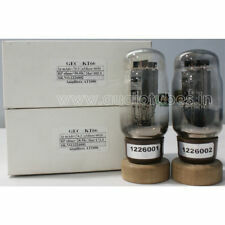 1 x n ew power tube KT66 CV1075. GEC UK tube in original military box. tube tests with 100% data current 75mA. Tested Advance Digital Tube Tester Amplitrex AT1000. - Amplitrex AT1000 Advance Digital Tube Tester. Tube tested emissions (100) life test (100). Tube tested: No leaks, No shorts, Good emissions. Tube tested strong. Cossor VT60 =807 ,made by Cossor in early 1940s in UK during "World War 2" FOR ROYAL AIR FORCE. Cossor VT60. You can buy adapters on the Internet, you can use 807 adapters, you can directly replace 6L6G/KT66/EL37/350B Now the price of 6L6G/KT66/EL37/350B is very high. All tubes checked as show. QUAD GEC KT66 Beam-Power Tetrode Tube. 4 pieces G.E.C KT66 NOS for LEAK, QUAD II, Williamson. I had sold my lovely QUAD II, and I do not need anymore. I had bought many years ago as NOS, and took them as reserve. Type : CV57. Match QUAD GEC Marconi CV57 tubes (WITHOUT THE SAMPLE AMPLIFIER). CV57 beam tetrode 'hard valve' modulator. The CV57 was used in pairs in parallel to modulate aCV64 magnetron in the AI Mk VIII in late 1941. 1 X NEOTRON 6L6G VACUUM TUBE VALVE. ELECTRONIC TUBE. TESTED & GUARANTED. NEOTRON 6L6G VACUUM TUBE VALVE. ELECTRONIC TUBE. TESTED & GUARANTED. 1pc Gold plated GEC KT8C KT8 to KT66 tube adapter. Every product will be tested before we send out. Tested Advance Digital Tube Tester Amplitrex AT1000. - Amplitrex AT1000 Advance Digital Tube Tester. Tube tested: No leaks, No shorts, Good emissions. Tube tested emissions (100) life test (100). Tube tested strong. Tested On AVO 160 Tube Tester. - AVO Type 160. Tube tested: No leaks, No shorts, Good emissions. Tube tested emissions (100) life test (100). Tube tested strong. - Amplitrex AT1000 Advance Digital Tube Tester. Tested Advance Digital Tube Tester Amplitrex AT1000. - Amplitrex AT1000 Advance Digital Tube Tester. Tube tested: No leaks, No shorts, Good emissions. All tubes are checked for Shorts, Emission, Life test, and Leakage. KT66 OSRAM (M-OV MARCONI - GEC). Tested Advance Digital Tube Tester Amplitrex AT1000. - Amplitrex AT1000 Advance Digital Tube Tester. Tube tested: No leaks, No shorts, Good emissions. Tube tested emissions (100) life test (100). Grey anode, Brown curved base, Cup getter. NOS value tube. The tube works perfectly! KT66 GEC Make. Tested Advance Digital Tube Tester Amplitrex AT1000. - Amplitrex AT1000 Advance Digital Tube Tester. Tube tested: No leaks, No shorts, Good emissions. All tubes are checked for Shorts, Emission, Life test, and Leakage. KT66 GEC Make. Tested Advance Digital Tube Tester Amplitrex AT1000. - Amplitrex AT1000 Advance Digital Tube Tester. All tubes are checked for Shorts, Emission, Life test, and Leakage. Tube tested: No leaks, No shorts, Good emissions. Tested On AVO 160. - AVO Type 160. Tube tested: No leaks, No shorts, Good emissions. All tubes are checked for Shorts, Emission, Life test, and Leakage. Tube tested emissions (100) life test (100). Inverted Cup Getter, Made in 1950's. Whether you are looking for unused or used vintage GEC KT66 Valves, you can find both in working condition and in all different price ranges on eBay. Before making your purchase, however, it is important to have your questions answered, so you know exactly what to expect when you receive your GEC KT66 tubes. On eBay, it is easy to buy and sell items, and you can find the answers to all of your questions if you know where to look. Are the GEC KT66 tubes compatible with Marshall Amps? These GEC KT66 valves are compatible with Marshall Amps and were widely used in Marshall Amps in the 1960s. The GEC KT66 tubes are actually the tubes that Jimi Hendrix and Eric Clapton used for their Marshall Amps when they were in their prime. What type of sound do the KT66 tubes produce? These tubes produce a tight sound that is also smooth and warm. They offer mid- and top-end chiming and can make your guitar heard over all the other instruments. The sounds that are produced are consistent, so you know you will always produce the sound you were expecting. You could even say that the KT66 tubes offer a textured sound, adding even more depth to the music. Who are the KT66 tubes appropriate for? The sounds produced are highly appreciated by professionals, and music enthusiasts enjoy owning the vintage tube as well. Even people who appreciate the sound they help produce could benefit from having them on hand for musicians who might borrow their amps. How long is the life of these unused tubes? While many of the KT66 tubes sold on eBay are unused, they are still vintage and have been stored for many years. The life length may depend on the amount of time they were stored for, and they may have slightly less than a full life left. The life length varies, but you can find many that have at least 97% of the life remaining. Nearly all of the tubes have been tested and are in working order, which will be mentioned in the individual eBay posting. Content provided for informational purposes only. eBay is not affiliated with or endorsed by GEC.